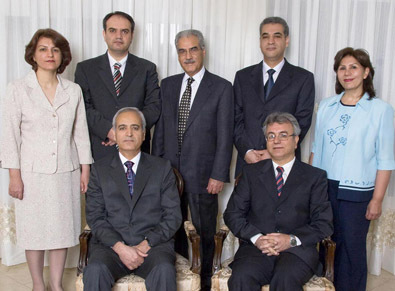 (BWNS) On 14 May, the Iranian Bahai leaders enter their third year of imprisonment without having been convicted of any crime. They are, top from left, Behrouz Tavakkoli, Fariba Kamalabadi, Vahid Tizfahm, and Mahvash Sabet; bottom from left, Jamaloddin Khanjani, Saeid Rezaie, and Afif Naeimi. Tomorrow night the Bahá’í community of Newcastle-upon-Tyne will be having a special prayer meeting for the Bahá’ís in Iran, as the seven sacrificial souls pictured above enter their third year in prison and the Iranian Bahá’í community as a whole face continued persecution. Referred to as leaders for ease of reference, the prisoners served as an informal body called the Yaran, or “Friends,” and attended to the spiritual and social needs of the Baha’is in Iran. The seven have been held in Tehran’s Evin prison since they were arrested in 2008 – Mrs. Sabet on 5th March and the remainder of them on 14th May. “No court hearing was held until 12 January this year when they appeared in Branch 28 of the Revolutionary Court. Charges including espionage, propaganda activities and “corruption on earth” were all denied. Further appearances took place on 7 February and 12 April. “In the three trial sessions that have so far taken place, no evidence has been provided whatsoever of wrongdoing – making it all the more obvious that the prisoners are being held only because of their religious belief,” said Ms. Dugal. “If their freedom is not immediately granted, at the very least they should be released on bail. Steps should be taken to ensure that their trial is expedited and conducted fairly, in accordance with international standards,” she said. Friday marks the second anniversary of the group’s imprisonment, and details continue to emerge about the severe conditions under which they are being held. It is known, for example, that the two women and five men are confined to two cells which are so small that they restrict adequate movement or rest. “They have neither beds nor bedding,” said Ms. Dugal. United4Iran, a human rights network, asked sympathizers around the world to replicate the dimensions of the cells in Evin prison and photograph themselves confined to the space. The place has a rancid smell, and they are permitted to have fresh air for only two hours each week. They have a light that if turned off during the day makes it impossible for them to see anything. “Contact with their loved ones is restricted to one 10-minute telephone call a week, or visits which are mostly conducted through a glass barrier,” Ms. Dugal said. “Such inhumane conditions show no regard for the principles outlined in international agreements for the treatment of prisoners, which provide that no one may be subjected to torture or to cruel, inhuman, or degrading treatment or punishment,” she said. “The prisoners’ own requests for modest improvements to their conditions remain unaddressed, and as a consequence their health is suffering. “These people are innocent, and there is no reason they should be made to suffer like this,” she said.